While on the subject of food and the environment for my last two posts, and as part of the research and reading, I came across an interesting book to help protect the future of UAE fisheries. The book is produced by the Emirates Wildlife Society-World Wildlife Fund (EWS-WWF) at their Choose Wisely site. “Sustainable Fish Recipes” includes 20 recipes by volunteers to help cook with sustainable choices of fish. EWS is a national environmental NGO associated with the WWF, one of the largest and most respected independent conservation organizations. They work with people and institutions in the UAE and the region to conserve biodiversity and promote sustainable living through education and conservation initiatives, among them Choose Wisely. Nevertheless, there is a problem of overfishing, or catching more fish than the oceans can sustain. The Emirates have a high demand for fish: 66% of residents eat fish at least once a week. Choose Wisely says studies show the overall number of commercial fish in the country has declined by 80% in the last 30 years and many species are being taken out well beyond sustainable levels. Choose Wisely is the consumer awareness campaign of the Sustainable Fisheries Project launched in April 2010 to raise awareness of the heavy exploitation of UAE fish resources and encourage consumer action to curb the demand on overfished species. They classified fish using a traffic light rating system of red, orange and green. With this rating system, EWS-WWF developed an easy-to-use consumer guide focusing on the most popular local species found fresh in markets and stores across the Emirates, for which stock assessments were carried out by the Environment Agency-Abu Dhabi (EAD). In the UAE, 60% of the total catch is made up of species fished beyond sustainable levels. 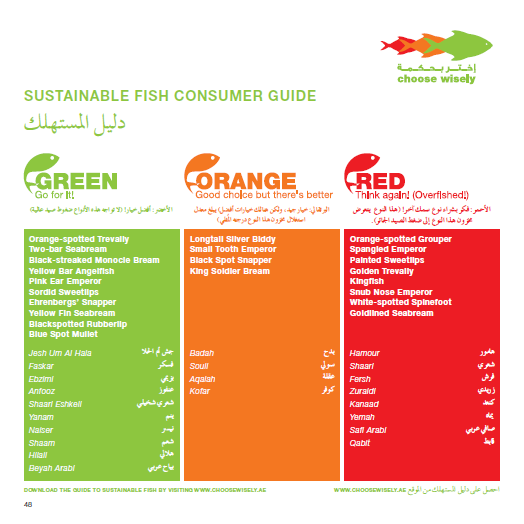 Eight of the most valuable commercial fish are being overexploited, including Hamour, Shaari, Farsh and Kanaad and others shown in the red section of the UAE fish consumer guide. Hamour, or Orange-spotted Grouper, is fished out at over seven times the sustainable level and is the most overfished species in the UAE, Choose Wisely says. 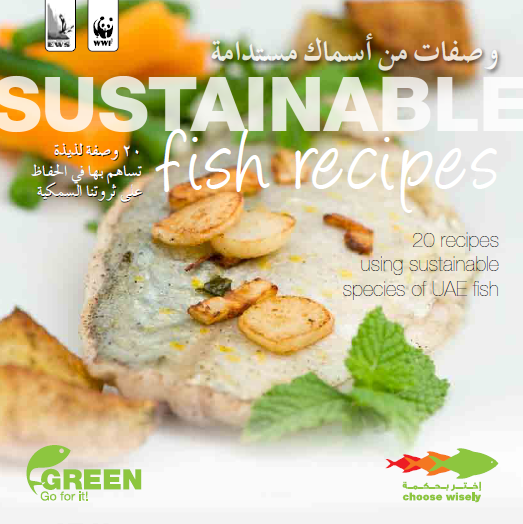 The 20 “Sustainable Fish Recipes,” which you can download here, are easy to follow in either English or Arabic. They include the name of fish to cross-reference with the guide and a picture of the fish to easily identify it when shopping. They all look delicious, among them the Roasted Faskar with Rosemary Potatoes by Irini Savva; Tamil Nadu Fish Curry with Ebsimi by Edna Joseph; the famous Lebanese Samkeh Harra (fish tagine) using Shaari Eshkeli by Rana Bayat; Fish Cakes by Jenny Hill with Shaari Eshkeli and many others. Worldwide, as well as in the Emirates, too many fish are being taken out too soon, leaving them little opportunity to reproduce. Unless a more cautious approach to fisheries management is adopted, studies predict a collapse of all species fished out for food by 2048. The UN’s Food and Agriculture Organization (FAO) says 80% of the world's main fish stocks are fully exploited, overexploited, depleted or recovering from depletion. An environmentally sustainable fishery is one in which species are not depleted. This is done by monitoring fishing activities and ensuring the methods used to catch the fish do not destroy marine habitats or catch non-target species that are then discarded. Commercial fishing in the UAE is carried out using a variety of traditional fishing equipment and technologies. Multi-gear artisanal fisheries catch over 100 species of fish from more than 35 families. The "gargoor," a dome-shaped wire trap, is by far the most important type of traditional fishing gear. In 2009 alone, these traps caught 736 tons of Hamour and 346 tons of Shaari in Abu Dhabi, making up 43.2% of the total fish catch in the emirate. It’s perhaps a good idea to print the guide and keep it handy when buying fish. Maybe we can help -- one fish at a time! Do you have any recipes, using the sustainable fish in the guide? Please share them if you do. What are the seven things you can remember? That’s what we will find out on November 11 after more than 100 million votes would have been cast to select what represents global heritage throughout history. The Seven Ancient Wonders of the World were all man-made monuments, selected by Philon of Byzantium in 200 BC. Today, only the Pyramids of Giza in Egypt remain. His selection of wonders was essentially a travel guide for fellow Athenians, and the stunning sites were all located around the Mediterranean basin, the then-known world. Today, rather than being chosen by one person, the New 7 Wonders of Nature will be picked by millions of people worldwide. Bu Tinah Island, a UAE natural treasure, is the only finalist from the Arabian Gulf in the New 7 Wonders of Nature competition. 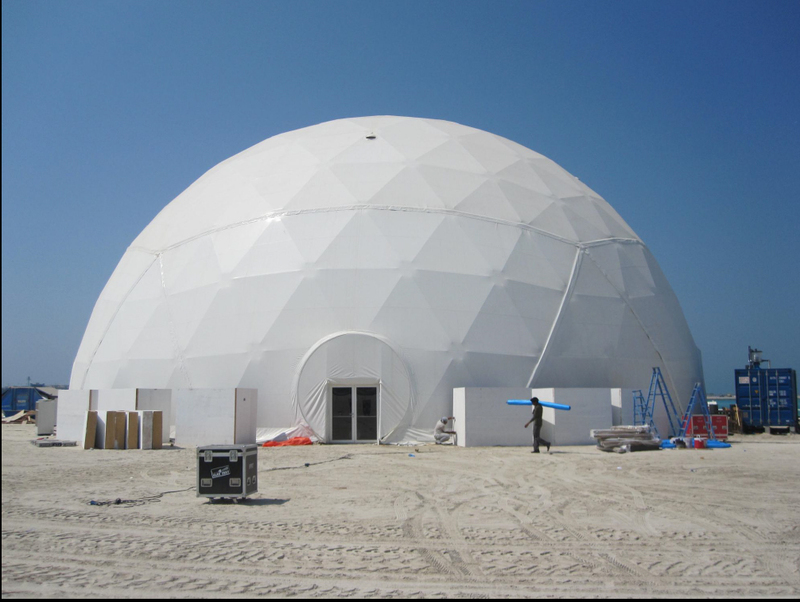 If you have visited Abu Dhabi recently, you might be wondering what the giant white dome on the Corniche is. You’re in for a wonderful surprise. It’s a project by the Environment Agency-Abu Dhabi (EAD) to bring Bu Tinah Island to the general public. It includes a turtle rehabilitation center and a mangrove nursery. Off the western coast of the UAE capital, Bu Tinah is restricted to visitors, except for scientific research. It is a protected marine area where nature is respected and allowed to flourish. Bu Tinah is an important ecosystem that has thrived through protection of the island’s unique environment, and the conservation of its habitats and inhabitants. Bu Tinah is part of the Marawah Marine Biosphere Reserve (MMBR), a UNESCO-recognized site and the region’s first and largest Marine Biosphere Reserve (MBR). Such sites are vital to promote more harmonious partnerships between natural and human activities. They are key to the future of sustainable development. In 2007, the MMBR became the first site in the UAE to be recognized as a biosphere reserve. It covers an area of some 4,255 square kilometers and includes Marawah, Jenanah, Salahah, Al Buzm al Gharbi and Bu Tinah islands. The MMBR is unique in that its inhabitants thrive under some of the highest temperatures and harshest living conditions in the world. Lessons on how to withstand global warming and climate change learned from this biosphere are highly relevant to the region and the world. The UNESCO Man and the Biosphere (MAB) Program is a collaborative effort of scientific communities worldwide to study the relationship between humans and the environment and to provide solutions for global scientific, environmental, societal and developmental issues. Since being established in the 1970s, there are currently 580 biosphere reserves in 114 countries. These sites are essential to achieving sustainable development in future. Bu Tinah Island has the highest density of Dugongs per square meter in the world. 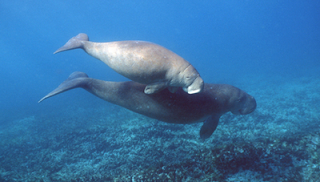 The Dugong, the island’s shyest character, is a gentile and graceful marine mammal also known as the Sea Cow. Green and Hawksbill turtles thrive on the island with three species of seagrass and over 21 species of marine algae. The endangered Hawksbill Turtle returns there every year to nest. Over 600 have been born on Bu Tinah this year alone, . Several bird species spend their winters on the island. Osprey, the Western-reef Heron, and the Bridled and White-cheeked Tern stopover and breed there too. It is also where the Socotra Cormorant has found its home, with approximately 20,000 to 25,000 birds making it their annual retreat. There is a long stretch of mangroves along the backwaters that reach an average height of five meters. Bu Tinah has been shortlisted as a finalist from almost 500 sites of outstanding natural beauty from around the world in the environmental prize of prizes, known as the New 7 Wonders of Nature. 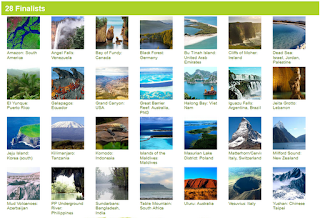 The global campaign began in 2007 to vote for a new list of seven natural wonders. From 440 nominations, from over 220 countries, based on beauty of the nominated site, ecological substance, historical legacy and geographical location, the list was narrowed down to 77. It is now down to 28 finalists. The competition closes on 11/11/11, so there is less than a month for a final push to support conservation and protect the UAE’s natural heritage by voting for Bu Tinah. Because of the importance of conserving Bu Tinah, activities on and around the island are limited. 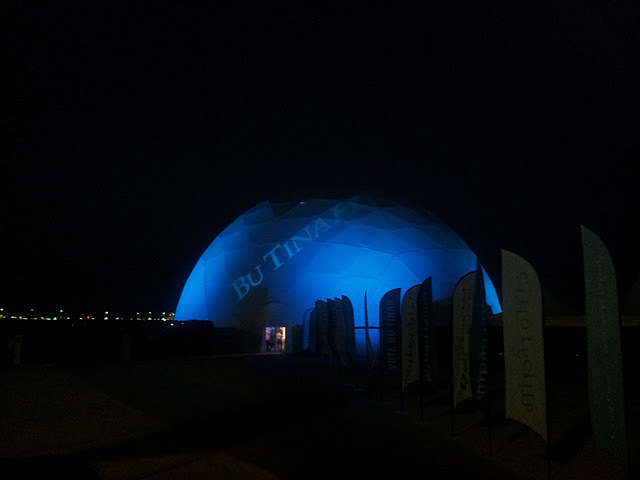 That’s where the Bu Tinah Experience comes in – and the dome on the Abu Dhabi Corniche. The island has been recreated for people to catch sight of what life on Bu Tinah is like. This initiative by EAD is to raise awareness on the UAE’s biodiversity. 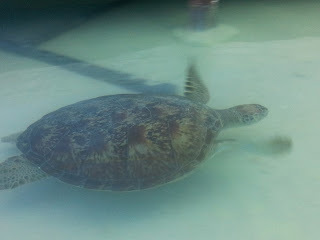 Inside the dome there is a lagoon with live endangered turtles from UAE waters and a mangrove nursery. The turtles are part of a rehabilitation initiative that rescues injured animals before releasing them back in the areas they were found. EAD was established in 1996 to preserve Abu Dhabi’s natural heritage, protect the future, and raise awareness of environmental issues. It is Abu Dhabi’s environmental regulator and advises the government on environmental policy. It creates sustainable communities, and protects and conserves wildlife and natural resources. EAD regularly monitors the turtles’ nesting and foraging habitats – providing vital information on clutch size, incubation period, hatching success and nesting patterns. It also investigates the species’ main causes of mortality in the region which have been identified as drowning in abandoned or illegal fishing nets (48%) followed by boat strikes (25%). 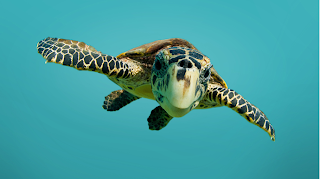 Of the seven species of marine turtles in the world, two predominantly occur in Abu Dhabi’s waters: the critically endangered Hawksbill turtle (Eretmochelys imbricata) and the endangered Green turtle (Cheloniamydas mydas). Worldwide, the International Union for Conservation of Nature (IUCN) Red List classifies the Hawksbill turtle as “critically endangered.” In Abu Dhabi, turtles nest on at least 17 offshore islands from mid-March to mid-June. The dome has an eco-cinema where visitors can view episodes of The Environment Show with Ask Ali series. The first episode was dedicated to the critically endangered Hawksbill turtle. A new episode of the series will be screened every week until November 13. Each episode of the series will cover critical environmental issues of relevance to the Emirates. The series is part of a long-term collaboration project between EAD and Ali Al Saloom (better known as Ask Ali), EAD’s Environmental Awareness Ambassador and UAE cultural ambassador and columnist. The dome is open to the public daily from 10 a.m. to 10 p.m. until November 13. Entrance is free. If you haven’t voted yet, have a look at the video below! Good luck to the UAE and to Bu Tinah. My first memory of food is that it’s something to be thankful for. 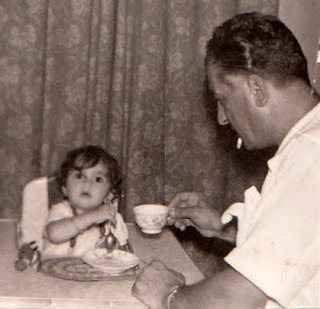 Indeed, from as far as I can remember, and following in my dad Esa’s lead, we never left the table or had something to eat without thanking my mom Vicky and God by saying Nushkur Allah (thank God). Food is to be shared. At home, there was rarely a day when we ate alone. Friends always dropped by, knowing they would be welcome at our table. Food is not to be wasted. By learning how precious it is while growing up, our plates were always wiped clean and I keep this habit to this day. Food is all the more precious when you go without. This is something we experienced in Beirut in 1982 during the Israeli invasion. We learned how to make-do by sharing a can of tuna or the famous blue tins of Kraft processed cheese. Food is precious on a low budget. In such cases, a packet of spaghetti can go a long way. Why am I talking about food? It’s Blog Action Day -- the annual event when bloggers worldwide unite to write about one important global topic on the same day. For the past four years topics have included water, climate change and poverty. 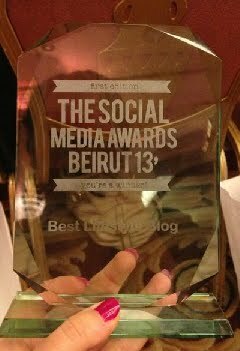 Over 10,000 bloggers took part. This year’s theme is Food, to coincide with World Food Day. World Food Day is celebrated each year on October 16 in honor of the date of the founding in 1945 of the UN’s Food and Agriculture Organization (FAO). FAO proclaimed it in 1979 to heighten public awareness of the world food problem and strengthen solidarity in the struggle against hunger, malnutrition and poverty. In 1980, the General Assembly supported observance of the Day because "food is a requisite for human survival and well-being and a fundamental human necessity." (Resolution 35/70 of 5 December 1980). Price swings, upswings in particular, are a major threat to food security in developing countries. Hardest hit are the poor. According to the World Bank, rising food costs in 2010-2011 pushed nearly 70 million people into extreme poverty. “Food prices – from crisis to stability” was chosen as this year’s World Food Day theme to shed light on this trend and on ways to mitigate its impact on the most vulnerable. To strengthen international and national solidarity in the struggle against hunger, malnutrition and poverty and draw attention to achievements in food and agricultural development. We use food to mark times of celebration and sorrow. Lack of access to food causes devastating famines, while too much is causing a host of health problems. It can cost the world, or be too cheap for farmers to make a living. World Food Day says the way companies produce food and drinks can provide important jobs for communities or be destructive to habitats and local food producers. Food can give energy to get through the day or contain ingredients that gives allergic reactions. Food is important to our culture, identity and daily nourishment. And the aim of Blog Action Day is to raise awareness and trigger a global discussion around this important issue that impacts us all. By writing about Food on the same day, the blogging community effectively changes the conversation on the Web and focuses audiences globally on that issue. Hopefully, out of this discussion, ideas, advice, plans, and action will flow. Last year’s theme was Water. Some 5,600 bloggers from 143 countries reached more than 40 million readers with discussions on a broad range of water issues -- from river conservation, to the ethics of bottled water, the increasing privatization of water access and the water crisis in Africa . Recognizing the major threat that food price swings pose to the world’s poorest countries and people, the international community, led by the G20, moved in 2011 to find ways of managing volatility on international food commodity markets. Stability in the food market depends on bigger investment in agriculture, particularly in developing countries, where 98 percent of the hungry live and where food production needs to double by 2050 to feed growing populations. Global hunger, according to Action Against Hunger, affects nearly a billion people. Deadly acute malnutrition, on the other hand, affects 55 million children worldwide -- 19 million of whom face outright starvation. One billion people live in chronic hunger. You can share in this day and sign the petition to end hunger. In the time it takes to watch the video below, two children will die of hunger. You could say it’s always a “special night,” when Twitter friends get together. But it was just so when we met at Tarek Booze in Gemmayzeh, Beirut, a fortnight ago. Abir Ghattas and Liliane Assaf – known as abzzyy and funkyozzi on Twitter -- organized the evening to welcome Paola Salwan Daher to Lebanon and announce “something” special! Tarek Booze, on Rue Pasteur in Gemmayzeh, parallel to Rue Gouraud, was a great discovery and one of those places you can only find in Lebanon. It starts with the place-name coming about from a play on words. When you describe someone in Arabic as “tareq booze,” it means the person is showing a sulky pout. I don’t know whether the place is a pub, a café or a restaurant! Whatever… Tarek Booze is ingenious through its simplicity. You can easily miss it on the ground floor of an old building at the end of Rue Pasteur. Walking into Tarek Booze is like going into a bunker or tunnel. Some paint has been slapped on, but not too much and it feels like a hideout. Thursday nights are designated kasser ou kib – Arabic for break and throw – cacahuètes that is. The bar lines the right-hand side and is known for its cocktails and affordable menu of sandwiches and salads. You can also have tea, coffee and shots of course, all served by Abir’s brother, Bachar. Apart from peanut-thon nights on Thursdays, Tarek Booze partner and manager Sylvain Nassar said they host Zuwwedet Aline, a vegetarian night with a theme on the first Monday of each month. Aline Khokaz Ian cooks the healthy dinner on the premises for all to enjoy. Other themes include quiz nights and acoustic live music and tarab. Michele Keserwany performs at Tarek Booze as do The Incompetents. We were celebrating many things on the night, apart from just getting together. For one, we were welcoming Paola and her husband Joseph to Lebanon from Switzerland. The couple write the very popular Café Thawra blog that covers political, economic and social subjects in both English and French. They try to give the West a better understanding of the Middle East, to fight misconceptions and promote understanding and tolerance. Paola recently published her first novel, “Café Noir, Café Blanc,” and writes a second blog, Myrrh and Mint – all of which are must-reads. The surprises didn’t stop at the Dahers. Maria Nachawi, a former Dubai resident who now lives in Paris, was in Beirut on holiday, so she dropped by to meet everyone in person. Maria is a jewelry designer who studied clinical psychology. She worked for Scintilla Monaco as a designer until 2010. Now a freelancer in art and jewelry design, Maria has been documenting her days in France with a photo each day on her blog Maria Studio. She paints too, and won the 2007 De Beers Award for the best Rayana design at the first diamond jewelry competition. We were also cheering Jennifer Haddad’s departure from a job she hated and starting with a new company. But not before she and Liliane embarked on a holiday to Italy and Spain. This we feted with a Smurfs cake, from Gustav of course! What else? Oh, yes… Abir announced that in November she and Liliane will be exhibiting their photography on the walls of Tarek Booze. What better place to do that? What a great evening in the company of such good friends. You too can join us at Tarek Booze in these pictures. 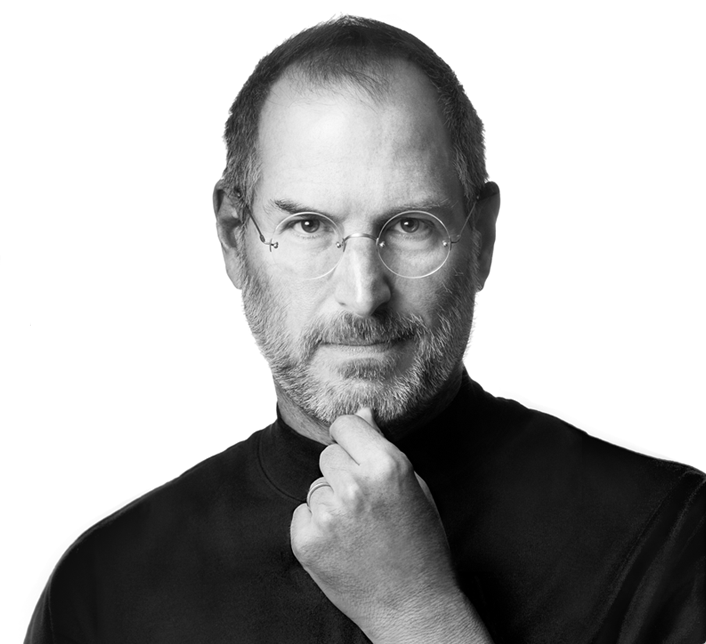 Waking up to the news that Steve Jobs has left us is painful. We all “knew” him, one way or another. We all admired him. He is among those who indeed changed the world and the worlds of millions of people around the globe who were touched by his genius. The first I heard about desktop computers and then something called Apple, with a colorful logo of a bitten apple, was in 1984, when I arrived in London. Coming out of 15 years of civil war in Lebanon, we had little time to worry about what was happening beyond our street. Don’t forget there was still no Internet, no Smartphones, and little communication with the outside world. Walking around, we stopped at a stand that had two machines that looked like an elongated square box. They were Apple Macintoshes. The literature next to the machines said something about In-House Desktop Publishing. We were hooked. We left with them in the boot of the car, after much arm-twisting. Steve Jobs released the Macintosh computer in January of 1984, with 128K RAM of memory. It had a 9-inch screen and operated with floppy discs. Before the Macintosh, all computers were 'text-based' -- you operated them by typing words onto the keyboard. You would run the Macintosh by activating pictures (icons) on the screen with a small hand-operated device called a "mouse." 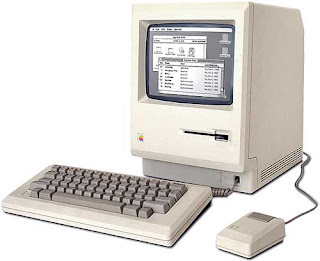 The Macintosh is thought to be the first commercially successful computer to use a Graphical User Interface (GUI). But back at the office, we didn’t know what to do with our new acquisitions. So we spent a day looking at them. On the second day, I went to Apple’s then-small center in Knightsbridge for a one-day course just to learn the basics. With our Apple Macintoshes, my company was then one of the first to go into In-House Publishing and indeed Apple “suits” came to watch the first issue of our newsletter “Mideast Mirror” roll out of our giant Kodak duplicator page by page in February 1985. Those first Apples stayed with us for a good 15 years, without a single problem or breakdown. We haven’t looked back since. Unfortunately, now I don’t own a MacBook, an iPod, iPhone, iPad or any “i,” but that’s only because I can’t afford them. That first Apple changed my professional life, it led to an adventure in information that I am still travelling, thanks to the genius of one man – Steve Jobs. Maybe one day, another brilliant mind can discover how to treat cancer, this awful disease that took him from the world so soon. Thank you, Mr. Jobs. Thank you for inspiring and revolutionizing the technology industry. Thank you for giving so much pleasure to so many people. Thank you… may you have found peace and goodbye. My last Saturday in Beirut was long-winded. I tried to take in as much as possible and see as many friends as I could. But I didn’t imagine I would be out from breakfast to breakfast the next day! That’s how it is in Beirut -- there is so much to do, it’s difficult to resist. Part of the day was spent in Gemmayzeh, the fashionable nightlife district of the capital that I had only visited at night. Luckily, I was invited there for breakfast and lunch -- the first at the beginning of the district’s main street, Rue Gouraud; and the second at its tail end.You can join me on my walk in Gemmayzeh in these pictures. Gemmayzeh’s Rue Gouraud, on the edge of East Beirut’s Ashafieh quarter, is a relatively narrow street, which for the past eight years has been one of Beirut’s most fashionable. It is named after French General Henri Gouraud (1867-1946) who represented his government in the Middle East from 1919 to 1923. As commander of French forces during the Franco-Turkish war, he presided over the creation of the French Mandates in Syria and Lebanon and commanded the forces sent to enforce the French allotment of the Levant. 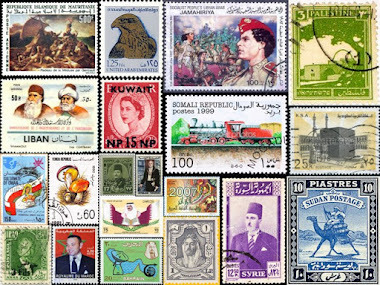 One of his decrees created the State of Greater Lebanon on September 1, 1920. He became head of the colonial government there. Gouraud is remembered for marching into Damascus in July 1920 to put down an anti-colonial rising, standing on Saladin's grave, kicking it and saying: "The Crusades have ended now! Awake Saladin, we have returned! My presence here consecrates the victory of the Cross over the Crescent." The next pub or restaurant? To the left and right of Rue Gouraud are picturesque narrow streets, the most famous of which is L'Escalier de Saint-Nicolas or L'Escalier de L'Art. It runs between Rue Gouraud and St. Nicholas Church on Rue Sursock up or down 125 steps. The 500-meter St. Nicolas Staircase has since 1973 been used as an open-air art exhibition twice a year and a venue for festivals. It is the Middle East’s longest stairway. With more than 120 bars, pubs, café, lounges and restaurants packed into Gemmayzeh, it is crucial for newcomers to be ever more original and creative in what they offer patrons to stay ahead of the pack. So much so, that the area is extending further along Rue Gouraud into upcoming Mar Mikhael. I took a “servees” -- or communal taxi -- from Beirut’s Hamra Street to get to Gemmayzeh. It was easy on a Saturday morning, free from week-day traffic. I stopped opposite Downtown Beirut’s blue and gold Al Omari Mosque and crossed the street to Rue Gouraud. My first call was breakfast at Paul, the first establishment at the beginning of the street with a beautiful garden. I met a dear friend, Hitaf Keirouz, to catch up on all our news. We enjoyed a platter of cheese and cappuccinos. Everyone must have had the same idea. The place was packed to the brim. I had more than half an hour to spare before lunch, so I slowly walked down Rue Gouraud, snapping photos left and right. Each building is a story onto itself. I was so taken by it all that I missed The Alleyway, where I was meeting my lunch companions and ended up in Mar Mikhael. I had been to The Alleyway’s The Angry Monkey a week before, but everything looks different at night. I retraced my steps to find our chosen restaurant, Couqley. Couqley is a French bistro located down The Alleyway. It serves traditional bistro meals prepared by executive chef and co-owner Alexis Couquelet, together with Ziad Kamel and Paddy Cochrane. Ziad and Paddy launched The Alleyway in 2009 in the little Gemmayzeh side street. It includes Couqley, Gauche Caviar bar, Cloud 9 lounge, The Union boutique and The Tanning Salon. I had heard a lot about Couqley’s weekend brunches while in Dubai through Ziad posting pictures on Twitter. It was apparently converted from an artisan’s workshop and features a traditional hand-cut mosaic stone floor, zinc bar and a pleasant and quiet outdoor seating area. I couldn’t believe it when my friend Mohammad Hijazi said we were invited there with Yasmine Hajjar, Maggie Abu-Khadra, Pierre Younes, Loulwa Kalash, Elie Fares, Hisham Assaad and Ghassan Deeb. After being well received and seated, we admired the premises, loved the table settings with checkered napkins, and quickly got to the menu. We wanted to try everything and very nearly did! Everyone wanted to try the "Escargots"
I went for the “Salade Endive Roquefort” and “Couqley Omlet with Hash Browns.” But we all shared and tried each other’s dishes, among them the “Quiche of the Day,” “Steak Tartar,” “Escargots,” the “Couqley Bavette” and several omelets, all washed down with freshly-squeezed juices. We looked to Ghassan, who doubles as a cook, for his verdict. Luckily it was positive. We saved the best for last and went halves on desserts – Belgian waffles and pancakes with different toppings and a Tiramisu for Elie and me. By 4 p.m., and hardly able to move, we took the traditional group snapshot and headed our ways. I set out to Café Younes in Hamra to meet Lindsay, who until then was a virtual friend. More photos of Gemmayzeh by day and brunch at Couqley.